On July 3, my wife, Bonnie, and I, both kayakers, decided to go for a paddle on Chesapeake Bay. 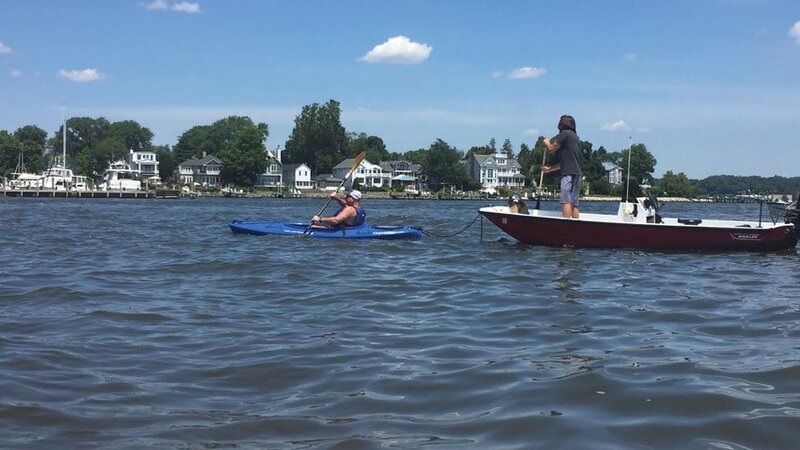 We are fortunate to live on Back Creek in Annapolis, Maryland, close to our community kayak rack. We gathered our gear and paddles and slid the kayaks into the water at 10:30 that morning. The day was beautiful and sunny with calm waters and a light, pleasant wind out of the west. As we glided through the water, Bonnie and I agreed to make it a short trip because we’d taken a long one the day before. We slowly paddled along the south coast nearing the entrance to Chesapeake Harbor Marina, giving way to a couple of sailboats going in and coming out. Feeling hungry, we started back to the creek. About halfway there, Bonnie spotted a 13-foot Boston Whaler paddling about a hundred yards from us. The captain looked like he was trying to get back to the creek, but the current was taking him toward the bay. Christian and Lucky were truly grateful, and I was rewarded by helping a fellow boater in need. When I got close, I asked if he needed help. He said he thought he was out of gas. He wasn’t wearing a life jacket and didn’t have an anchor. Plus, he had a little dog named Lucky who didn’t have any water. My arms still felt good, so I suggested I tow him in with my kayak. He laughed; Bonnie thought I was crazy. I told him I had the advantage because I could steer better and provide forward motion. He laughed again but said OK. He tied a line to the back of my kayak, and off we went. On the trip, I learned his name was Christian, and he was from California visiting his brother. I asked if the boat started sputtering when it ran out of gas or if it just quit. He said it just quit. The more we talked, the more I could tell the guy didn’t know much about boats or safety. As we entered the creek, the water calmed down. It was still a hard tow, and my arms were tired but doing OK. Bonnie was running point about 20 yards in front to assure we were clear rounding other boats. One sailboat did offer help, but we were three-quarters of the way to our destination of Water Gate, so I told him I had it. As we approached the outer piling, I angled Christian’s bow in so he could reach a slip. He was finally home. It took me over an hour to get him in, but it was worth it. Christian and Lucky were truly grateful, and I was rewarded by helping a fellow boater in need, though this particular boater needed some training before he threw off his dock line again. Jon Evans and his wife, Bonnie, moved to Annapolis, Maryland five years ago. They joined Annapolis Sail & Power Squadron/5 in 2017 and have taken many USPS seminars. Jon and Bonnie own a 24-Foot Albaco Scout. They enjoy fishing, exploring, kayaking and doing volunteer work for the Chesapeake Bay Foundation.